“Let everything that has breath praise the Lord” (Psalm 150:6). 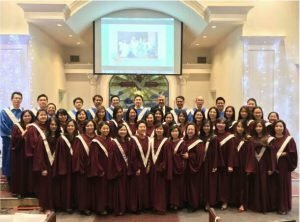 The Choir was established shortly after NLBC was started by Pastor Peter Wongka in 1985. At its inception, the choir was directed by Pastor Wongka himself. It is now directed by Mercy Tan. The choir has a weekly practice on Sunday from 2:30-4:00 PM. The goal of the choir is to glorify the name of the Lord. By praising our God, the choir also prepares the heart of worshipers prior to hearing the sermon.